New York has Greenwich Village. San Francisco has the Castro. Vancouver has the West End. 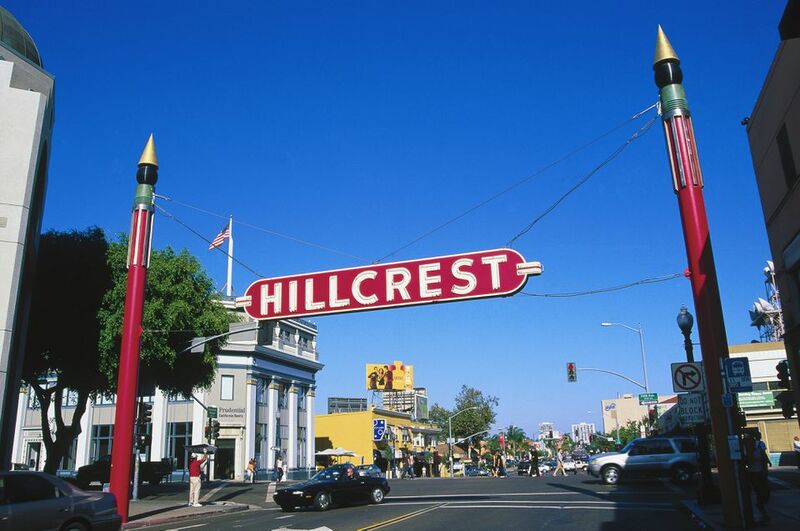 And San Diego has Hillcrest, a lively, gay-friendly neighborhood just north of downtown and Balboa Park. North Park is a mix of apartments and bungalows alongside a pedestrian-friendly business district. Hillcrest celebrated its centennial in 2007. In 1906 this neighborhood was called “University Heights” along with much of San Diego’s uptown area. William Wesley Whitson purchased the Hill Estate and subdivided its 40 acres north of University Avenue to Lewis Street (between First and Sixth avenues) and opened a “Hillcrest” sales office at Fifth and University. Hillcrest has everything that exemplifies a pedestrian-friendly, lively, urban neighborhood. It has blocks and blocks of restaurants, bars, entertainment, shopping, and services, so residents and visitors can do pretty much everything in Hillcrest. Combine it with lots of color and character, and Hillcrest is a vibrant community. Hillcrest is San Diego's de facto gay community. Oh, sure, gays and lesbians live everywhere in San Diego, but it's in Hillcrest that the gay community has been embraced and included. Hillcrest also has many unique boutique shops and a delicious dining scene. The best way to take in Hillcrest is to take a stroll through the neighborhood. The best place to start? Under the iconic Hillcrest sign that spans University Avenue at Fifth Avenue. Dining, ​shopping, and entertainment of every taste can be found along the adjacent streets. Here's where you can't go wrong: Hillcrest restaurants provide something for nearly every dining taste and every budget. On the low end, you've got the La Posta taco shack on Washington and Ichiban for Japanese food on University. Then you have the venerable California Cuisine and Kemo Sabe for the more sophisticated palates. You can also find just about everything in between, along with the usual assortment of national chains, though it's best to seek out the local and independent places like Crest Cafe and Hash House A Go Go for a truly memorable dining experience. Well, Urban MO's is the place to start if you want immersion into Hillcrest: outrageous and lively, with food and drink and gay cowboy nights (yep). Wine bars are big here, too: the Wine Lover, Wine Connection, Crush and Wine Steals are popular. For dive bars, the Alibi and San Diego Sports Club are the places. And for classic gay and lesbian bars, you've got the venerable Brass Rail and the Flame. For movies, the Landmark multiplex shows mostly indie films. Head to the Village Hat Shop for all your headgear needs (including fun hats for the Del Mar Racetrack Opening Day), Buffalo Exchange and Flashback for hip vintage clothing, Trader Joe's and Whole Foods for groceries or simply browse through the many other local boutiques in Hillcrest. Hillcrest is just north of downtown San Diego, easily accessed from State Route 163, which cuts through the area. From the I-8, take the SR 163 south and take the University Avenue exit -- it drops you right in the heart of Hillcrest. The primary thoroughfares are University Avenue and Washington Street (east-west), along with Robinson Avenue; and Sixth, Fifth, and Fourth avenues (north-south), as well as Park Boulevard on the east end. The Fifth Avenue stretch between Robinson and Washington is considered the heart of Hillcrest. The neighborhood is roughly bordered by Park Avenue on the east, First Avenue on the west, Washington Street on the north and Pennsylvania Avenue on the south. It is bordered by Mission Hills to the west, University Heights to the east, and Banker's Hill to the south.